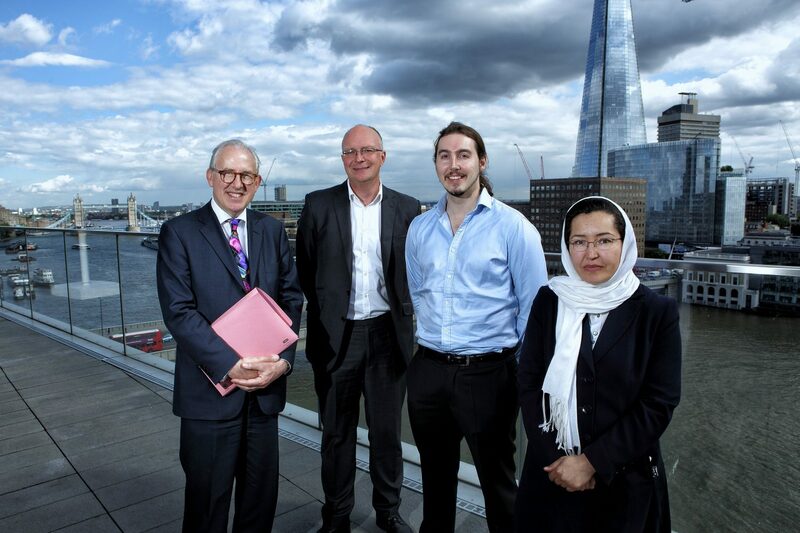 Photo left to right: Hamish Sandison of Fieldfisher, Simon Bond of SETsquared, Peter Davies of Green Running, Shakardokht Jafari of Invivo Dosimetry. A group of universities has launched a brand-new event that aims to get university spin-outs and technology start-ups into some of the world’s biggest corporates. SETsquared, a partnership of the universities of Bath, Bristol, Exeter, Southampton and Surrey, says that the UK economy could be boosted by large corporates adopting technologies from agile start-ups to increase their productivity, sales and innovation. Today it held its first ever ‘Open Innovation Showcase’, which brought 20 of its most cutting-edge technology start-ups face to face with corporates including Barclays, BAE Systems and Intel. It is the first time such a large-scale event, with start-ups pitching to more than 50 corporates, has taken place. The start-ups, working across a range of sectors including healthcare, mobile technology and environment, had the opportunity to pitch the corporates on how their technologies and products could be adopted by the businesses to the advantage of both sides. A software platform that analyses location data by time, not distance. The technology, from iGeolise, is already being used by the likes of Zoopla and Countrywide. A measurement system which checks the quality of radiation treatment from start-up Invivo. A number of strong leads were made at the event and over the coming months some of the start-ups could enter negotiations with the corporates to take on their technologies. Today’s showcase marked the launch of the next phase of SETsquared’s Open Innovation activities. Initially funded by the IPO, the programme has already seen success in phase one with Ripjar, part of SETsquared’s incubation programme, having its advanced social media analysis software taken on by a large banking corporate. Six of the start-ups at the showcase came from the ICURe programme, which is funded by SETsquared in partnership with the Higher Education Funding Council for England and Innovate UK. ICURe is a multi-million pound pilot programme giving early career researchers at the five SETsquared universities access to up to £50,000 each to explore the market potential of their ideas, technologies and products.